Reliance Jio introduced an new and attractive promotional plan as a part of the Republic day for its Jio Phone Users. The new plan is priced at Rs. 49 which give the customers a 28 days validity with Unlimited Calls and a total of 1GB Data. The new plan is basically for those who does not requires data too much but only calls. Thus this plan let them pay a small amount and will get unlimited calls for 28 days. This plan came in to existence on 26th January as a part of the Republic day promotion. The company also launched data add-ons for Jio Phone at Rs. 11, Rs. 21, Rs. 51, and Rs. 101. 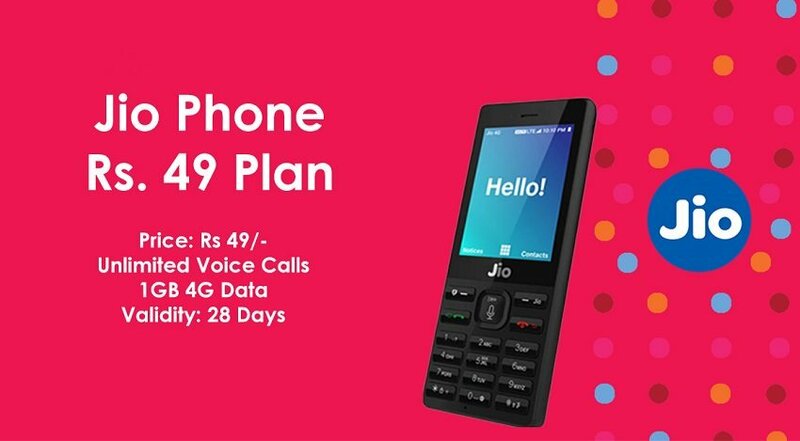 Jio Phone was launched in last July with a monthly plan for Rs. 153 and it provides the users services such as JioMusic, JioTV, and JioCinema. Along with the servces, it also offered a daily 500MB data and unlimited calls too for 28 days. The feature phone was available to purchase at a price of Rs. 1500 which is a deposit amount and will be refunded back to customers if they continue the full 3 year term . The Jio Phone features a 2.4-inch display with 240×320 pixels resolution and is powered by a 1.2GHz dual-core processor, coupled with 512MB RAM. The phone has a 2-megapixel rear camera sensor and a 0.3-megapixel front camera sensor and packs a 2000mAh battery. Absolutely and the cache is 1 gB data for whole 28 days and in realty there is no tethering with jip feature phone and this means this is going to stay for almost a month.